Azucar huayo is a very little known fruit from the Amazonian region. Its vines grow on river banks in the west western Amazon region of Brazil, Peru, Ecuador and Bolivia. The plant, however, does not grow above an altitude of 100 m.
Fruits small, 1.8-2.5 cm long, 1.2-2.4 cm wide, black at maturity, sweet, very tasty to eat, borne in numerous bunches 10-15 fruits on each vine. Azucar huyao fruits are edible and very much liked by the fishermen who eat these while working on the shores of channels and lakes. According to the fishermen, many fish also like and eat these fruits. 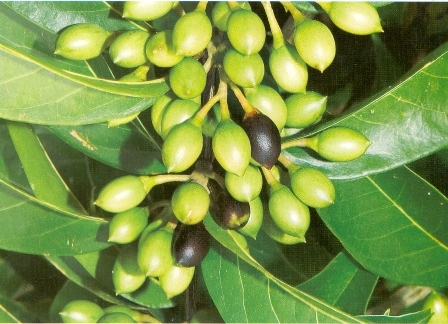 The fruits are tasty, very much like and eaten in plenty by the people visiting that area. These provide a very heartening snack. But still the fruits are not sold in the market. The colour of pulp is also very unusual. Very few fruits have a black coloured pulp. It could provide some new idea to chefs keen to prepare desserts with a novel colour and texture. 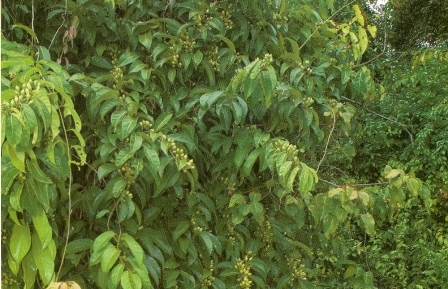 Azucar huayo vines grow only in the wild. These do not seem to have been yet planted outside its natural habitat. This fruit deserves to be brought out of oblivion and made popular. AS it appears from the plant, it should not be difficult to bring it under cultivation.